We all have a ton of music on our phones and we all think we’re DJs. Admit it, you think your personal playlists are the bomb-diggity. If you’re somehow convinced you have musical spinning skills, you might as well hone them a bit with the M1X-DJ Sound System, the device that lets you spin just like a DJ. Well, not just like. It won’t exactly give you perfect knowledge of when to drop the bass to make the crowd’s head explode but it will let you do a bit more than plug in your iPod and push play. This is not full DJ equipment but it simulates it for the casual music mixer. Aside from killer speakers so that you can get really feel that bass kick in, it also includes some functionality to take your music mixing to the next level. It’s a really fancy dock for the most part so hook up your own device. It also has two scratch wheels and cross faders so you can get the vinyl sound without actually using vinyl. It works with lighting docks or through Bluetooth. 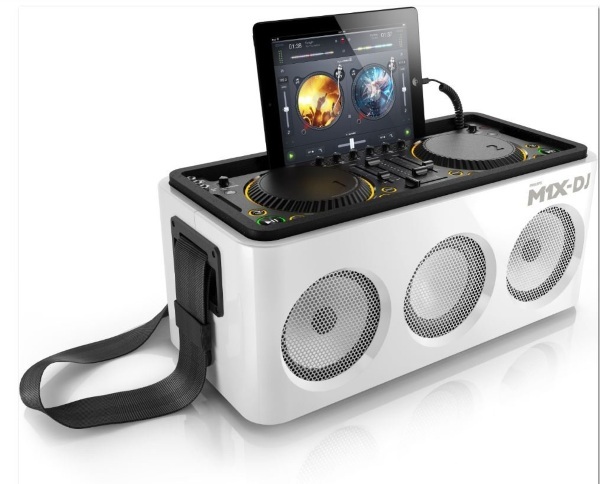 The M1-DJ Sound System costs $399.99.